The World Cup opens Thursday in Brazil and along with the beautiful game that can be seen on the field, there's plenty of off-the-field action as well. This year's tournament takes place in Brazil from June 12 to July 13, and the Latin American county has so far spent about $63 billion on infrastructure ahead of the games. This hefty spending in a country beset by poverty, corruption and crime means this World Cup is shaping up to be one of the most controversial events in FIFA history. Here are 10 things you should know about the world's most popular sporting event. Street artist Paulo Ito painted an untitled work on an elementary school fence that captures the sentiments of Brazilians who think the World Cup should be disrupted in favor of social issues. An image of the painting was reportedly shared more than 96,000 times on Facebook, according to the LA Times. Protests have continued throughout the country as discontent grows over the amount of money spent on building and refurbishing the 12 stadiums, the cost of which have quadrupled from initial estimates, making the 2014 event the most expensive in FIFA history. Not all art work coming out of Brazil has been political. The Brazilian national team will get to travel on a plane made over by artists and identical twins Otavio and Gustavo Pandolfo, also known as "Os Gêmeos." They used 1,200 cans of spray paint to cover a Boeing 737 with faces that they say represent the diversity and color of Brazilian culture. 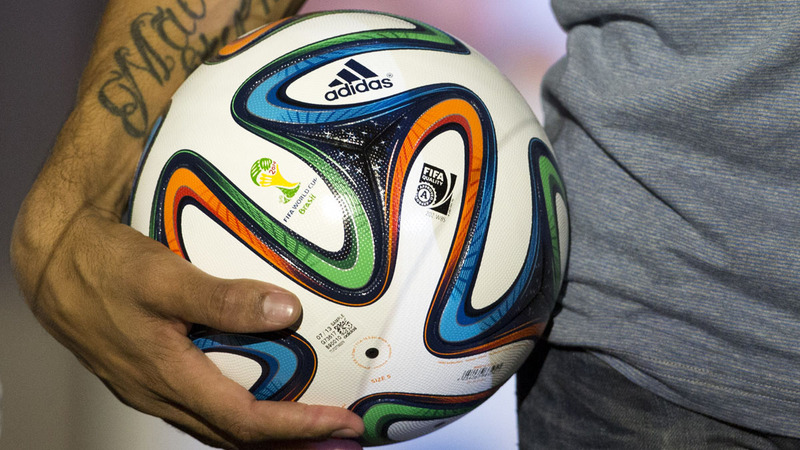 A new soccer ball will make its World Cup debut when Brazil and Croatia play in the tournament opener on June 12. Adidas says the "Brazuca" was tested by more than 600 of the world's top players, 30 teams and in more than 10 countries over two and a half years, according to The Associated Press. The ball is made with fewer panels, with each panel exactly the same shape and size, which means the ball is more accurate, according to an Adidas spokesperson. Portugal's Cristiano Ronaldo is the most marketable soccer player in the world, according rankings determined by sports marketing research company Repucom. Globally, 83.9 percent of people know of Ronaldo in Italy, Spain, Germany and Turkey. The figure goes up to 95 percent in Argentina. This is a boon for the 29-year-old, whose global appeal will surely be used to drive sales for big brands during the World Cup. The U.S. team arrives in Rio with low expectations, even from head coach Jurgen Klinsmann, who has said his team can't win the tournament. He's probably right considering the team's opponents in the first round – Germany, Portugal and Ghana - but fans likely would have appreciated a bit more optimism before play begins. Cutting the team's most recognizable player, Landon Donovan, who is also the all-time leading goal scorer for the U.S., didn't endear the German-born coach to Americans either. Perhaps Klinsmann is hoping to surprise rather than disappoint. Brazilian newspaper Lance compiled a list of unusual requests from the soccer teams participating in this year's World Cup. SB Nation kindly translated the list here. France, for example, will only use liquid soap. No bar soap for the French. The Chilean team wants new beds and new TVs for every hotel room it stays in. Team Ecuador wants a basket of bananas in every room. And Portugal wants six bodyguards at all times, four of which are just for Cristiano Ronaldo. Tourists craving a Big Mac a Coke or just a place to sleep will be in for some sticker shock. Hotel prices have more than doubled ahead of the World Cup, according to the AP, and so have prices for iPhones, Nikes and Levi jeans. But nothing beats the $6.70 Big Mac, which costs $8.90 with a Coke and fries, making it one of the most expensive Big Macs in the world, the AP said. The Washington Post's Brazil correspondent Dom Phillips tweeted a series of photos that capture the cost of popular everyday items with their sticker price in Brazilian real. Check them out here. An ocelot will give Paul the Octopus and his eight legs a run for his money this year when she makes her way to the world stage as the new World Cup predictor. PRI's The World launched a Twitter account on Monday for Isidoro, a Brazilian ocelot tasked with predicting the outcome of U.S. World Cup games. The team at PRI teamed up with the Franklin Park Zoo in Boston to get Izzy involved in this year's tournament. Her first prediction for the U.S. versus Ghana match on Monday will be announced on Friday. My first prediction is: I will predict all #USMNT games correctly. Twitter is bringing back hashflags, which they introduced in 2010, to pepper Twitter feeds with country flags that appear each time a user puts a hashtag in front of the relevant three-letter country code. Brazil took a page from South Africa's playbook and introduced their own noisemaker ahead of the World Cup. The caxirola (pronounced cah-she-rolla) was invented by Oscar-nominated Brazilian composer Carlinhos Brown specially for the tournament. The hand-held plastic shaker with finger grips has been certified by the Brazilian Ministry of Sports and FIFA. And much to the relief of everyone's ear drums, a report said that it would take 30,000 caxirolas to make the same amount of noise as one vuvuzela, which some have called an "instrument of torture."